Peer ki Gali, the very name sounds charming and mysteriously magical. Like a land far away where everything is different; where everything is beautiful. And beautiful it indeed is. There is nothing here really except for a shrine, a road, a few shepherds and plenty of natural beauty. But it is still a place that is hard to express in words. With a cool breeze sweeping across your face; clouds occasionally descending so low that you could barely see a few steps ahead; a few horses lazily grazing near a rivulet formed by a melting glacier nearby; a few shepherds idly herding plenitude of sheep; it truly is a picture perfect therapy for the tired eyes. 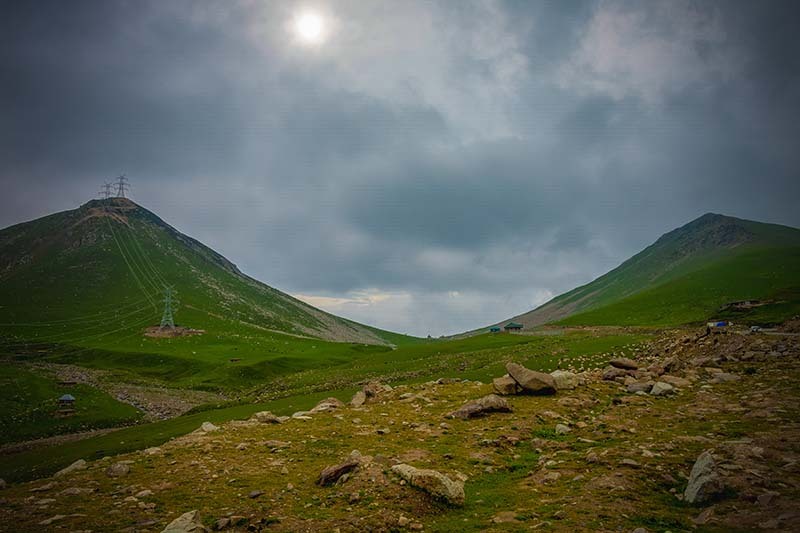 Peer ki Gali, also spelled as “Pir Ki Gali” is the highest point of Mughal Road; a Pass at an elevation of 3,485m (11,433 ft) above the sea level, located in Jammu and Kashmir. With Bafliaz on one side at a distance of 55 kilometers and Shopian on other at about 45 kilometers, this pass is almost the mid point of Mughal Road. Traveling from either Bafliaz or Shopian, you climb up all the way till Peer ki Gali. Here you stop a for a minute; pay respect at the Shrine, pass through the “smile like” formation between the two mountains and climb down to the other side. In many ways, Peer ki Gali reminded me of Rohtang Pass in Himachal because the vistas look very similar. It is however far more scenic that a crowded Rohtang where you can’t even click a single picture without someone’s head popping up in it. The word “Peer” means a person who is devoted to religion and in case of Peer ki Gali, it refers to Saint Sheikh Ahmed Karim. There are many stories related Sheikh Ahmed Karim and how he performed miracles in order to help people. Even today, you can see that people still have a lot of faith in him. Not even a single car passes by here without stopping in front of the shrine. People would step out of their cars, pay respect, and have a “namkeen chaai in mitti ki pyaali with sattu” which is offered here like prasad in front of a temple, before moving on. It is interesting to know that it is actually the saint’s grave here at the shrine. He was buried near the grave of Makhdoom sahib and in the north of grave of Bahuddin Ganj Bakash in Kashmir. Peer ki Gali was actually the place where he used to meditate; and inside the shrine here are imprints of his hands on a big stone. Interesting thing to note here is that Emperor Jahangir had in fact died at the town of Rajouri while returning from Kashmir. As per the legend, Jahangir did not pay heed to saint’s instructions to pass silently and upset the saint terribly after getting into an altercation with him. Jahangir, in his arrogance, insulted the saint and as a result, paid the price with his life. Local come to pray at the shrine often. It is believed that the saint will still come to help whenever someone calls. It is however just not the spiritual part that makes the spot worth visiting. The entire drive to Peer ki Gali from either Bafliaz or Shopian is amazingly scenic and even adventurous. If you are visiting Kashmir then I would highly recommend paying a visit to Peer ki Gali as well. You can make it a day trip from Srinagar and include Aharbal as well in your itinerary. From Srinagar, you will first drive to Shopian and then take the diversion towards Aharbal which is about 15 kilometers from here. After visiting Aharbal, you will drive back to Shopian and then reach Peer ki Gali; at a distance of about 40 kilometers. After spending some time, you will then return to Srinagar by evening. The entire trip can be easily done in a single day. Another option is to travel to Srinagar via Mughal road. Rather than the crowded NH44, you can take the route via Rajouri, Mughal Road and Shopian to travel to get to Srinagar. It is way more scenic and there is almost no traffic on it. Or you can return to Jammu from Srinagar via this route. I hope the information above was of help. If you have any other questions; or need any further details; please feel free to ask in the comments section below; or at our Community Forum; and I will be glad to answer.